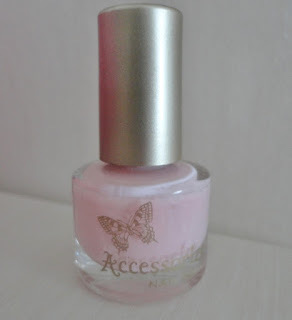 For Christmas, I received a Accessorize Nail wardrobe as a present and I absolutely love it. It consists of nine nail varnishes, of which 3 are glitter and the other 6 are a variation of different colours of pink. I love the set and all of the colours in it, there is a blue and a blue glitter, two other pink glitters and five pinks ranging from light pink to red. I started off doing my nails, by doing two coats of light pink. What I love about the pale pink colour is that it will go with anything. It is an elegant and casual colour that I can wear with any outfit. I wanted to add some sparkle to my nails, so I added one of the glitter nails varnishes. I choose to use the red/silver glitter nail varnish instead of the bright pink glitter one, as I wanted to keep the pale pink and the brighter pink glitter one made the pale pink brighter. You could easily use the glitter by itself but personally I think it looks better with a background colour. The end result is really good and pretty. I think the combination of red/silver glitter goes well with the pale pink. 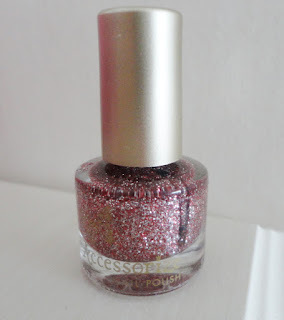 I love the Accessorize Nail wardrobe set, especially the glitter nail polishes. It is available from Superdrug for £9.99.